I'm only aware of fractals really rather than knowledgeable about them but with any luck somebody else will be able to tell us some interesting stuff in a rather more technical sense than my appraisal which starts and essentially ends with 'they're geometric objects which show infinite and more or less repeating complexity and can mimic the form of some natural objects (except that in the case of natural objects the repeating complexity is not infinite)'. The most famous example is of course the Mandlebrot Set but there are many others. The music's by Jonathan Coulton. What follows is my quick and dirty explanation of the Mandelbrot set. Please bear in mind that I'm a software guy, not a mathematician, and I learned just enough to write the program. Notice that this gives us a new complex number with real part a² - b² and imaginary part 2ab. |zn| ² > 4; i.e. (an² + bn²) > 4. Since we need an² and bn² anyway, it's pretty efficient. You will find the algorithm in the function MandelbrotSet.IsInSet(). This is called from CreateMandelbrotImage() in the MainForm form As you will see, not much code is needed to create the image; most of the code in the app deals with the zoom selection and view history. You can download a viewer from the site which works well enough but is in shades of grey rather than colours unfortunately. Also what he's done is use white for the surround and black for the 'body' which might confuse readers who are trying to relate the description to the images above (which do not themselves have consistent colour definitions from one to another). I suspect that the area 'inside' the set represents points which dwindle to nothing rather than scooting off to infinity but It's 4am and I'm not going to check this, not right now anyway. I rather suspect natural forms and processes, geological and biological ones anyway, have rather more to do with slight variations in an otherwise constant environment affecting a process which is governed by a fixed set of rules (such as nutrient provision, concentration gradients of growth factors or rate and nature of the process of erosion) than they they have to do with complex numbers or indeed mathematical processes generally but that doesn't make fractals any less interesting. From the POV of trying to mathematically model biological processes I would think that the results of a good fractal simulation (or more probably the equation used) might well shed some light on certain phenomena but would not be applicable at the level of molecular biology where one polymer subunit for example is indivisible if it is to funtion in its biological role. 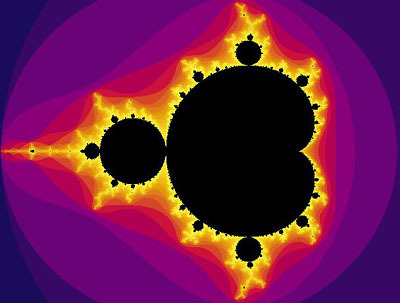 Perhaps there is something in the fact that nothing in biology can be infinite and similarly nothing can be zero and be said to exist in a practical sense so if the patterns seen in the Mandelbrot Set look organic perhaps that is a reflection of a commonality which relates to the boundary conditions. To misquote Kipling “science is science and art is art and the twain shall always meet”. It can be argued that all art uses scientific principles or can be modelled using them; or not. But, let’s leave this one - I think it deserves a thread of its own. Now fractals are fascinating chaps and ever since the name was coined by Mandelbrot in 1975 they have been used in a wide number of fields. As part of the geometry of chaos they have been used in areas such as predicting weather systems and stock market trends and in explaining the clustering of galaxies and the height of ocean waves. They have been used to demonstrate that patterns of tiny, seemingly unpredictable, short-term fluctuations can be shown to be repeated again and again over the longer term. And so proceed, ad infinitum. One of the simplest forms of fractal is known as the Koch Curve and it can be produced using a pen and paper. We take a straight line (initiator) and remove the middle third and replace it with two lines of a length equal to the lines on either side so that they meet forming the apex of an equilateral triangle. This new form (generator) specifies the rule that is used to generate the new form. Then repeat for all straight lines on the new form. We can repeat this process again and again ad infinitum and so the resulting Koch Curve will have an infinite length. This has important implications when we consider the question of, for example, how long is the coastline of Great Britain? This is all the more relevant because it was a question Mandelbrot posed in a paper published in 1967 entitled How Long Is the Coast of Britain? Statistical Self-Similarity and Fractional Dimension (linked below). This paper is perhaps best known due to the mistaken belief that Mandelbrot proved that its length is infinite. He didn’t and it isn’t; he was using it as an example to illustrate a concept, noting that it exhibits self-similarity over a wide range of (but not all) scales, (he actually described it as ‘undefinable’). But, what he did do was demonstrate that its length will increase as the scale of measurement becomes smaller and that the question is meaningless unless this scale is given. This is known as the Richardson Effect after the British mathematician Lewis Fry Richardson who first investigated the relationship between units of measurement and lengths of coastlines. 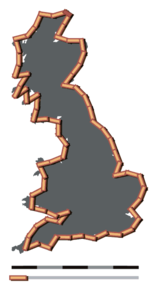 The following are outlines of Britain with the measurement scales of 200km, 100km and 50km. So while coastlines do not have the properties of true fractals Mandelbrot showed that they demonstrate enough ‘self-similarity’ as to make the calculation of their length somewhat tricky. What do you mean by length? What is the scale? Etc etc. The Koch snowflake is (log 4/log 3) dimensional, which fact made my head revolve more than a little. And apparently the British coastline is somewhere in the region of 1.2 dimensional. Any coastline can be effectively regarded as being of infinite length. It's all to do with resolution. Surely, that can be done with any shape, or (as I suspect) am I missing something here? Another 'head-revolving' property of certain simple fractals is that a finite space can be enclosed by an infinite perimeter (as opposed to, for example, a circle which has a finite area enclosed by a finite perimeter). 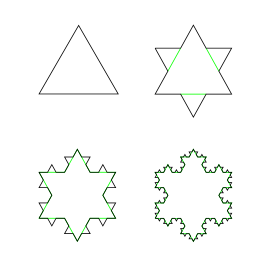 A very good example is the Koch Snowflake which is similar to the Koch Curve, described above, and is formed in a similar way. In traditional Euclidean Geometry the dimension is the number of independent parameters needed to describe a point in a set. Eg a point in a plane would have two Cartesian coordinates (x,y) and the plane would thus be two-dimensional. This definition is always a natural number (ie a positive integer). 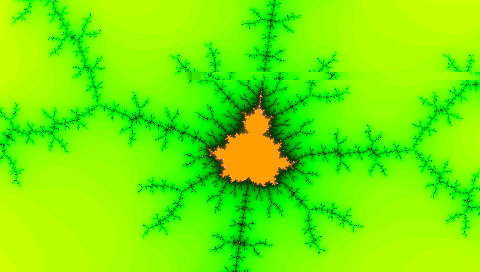 Fractals are highly irregular sets and their dimensions can take into account real (metric) numbers. These dimensions are known as Hausdorff Dimensions. 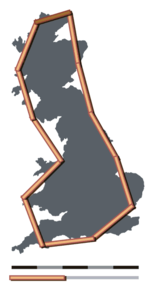 The Hausdorff Dimension of the coastline of Britain is very similar to that of the Koch Curve. A line (a regular Euclidian object) has a dimension of one. In general terms the more uneven and jagged the line the larger the fractal (Hausdorff) dimension. This does not mean that the British coastline has the properties of a Koch Curve. As Mandlebrot showed it exhibits self-similarity over a wide range of (but not all) scales. Mathematics is not constrained by nature and will ultimately break down under the constraints of the natural world. The length of any real coastline cannot be infinite. Here is a list of fractals by Hausdorff Dimension. And a weird and wonderful collection of beasts they are too (sponges, dragons, dust, carpets, gaskets etc). Peano curves are quite interesting. If you measured a piano curve how long would it be? When crumpling sheets of different sizes but made of the same type of paper and with the same aspect ratio (for example, different sizes in the ISO 216 A series), then the diameter of the balls so obtained elevated to a non-integer exponent between 2 and 3 will be approximately proportional to the area of the sheets from which the balls have been made. Creases will form at all size scales (see Universality (dynamical systems)). I wonder if comparisons of Hausdorff dimensions of animal brains have been made. If intelligence is related to the degree of folding of the surface of the brain as is thought then the higher the Hausdorff dimension the more intelligent the animal should be (bearing in mind always that the Hausdorff dimension of broccoli is 2.66). A study by Melbourne scientists has provided the first direct evidence that differences in the way the surface of the human brain is folded could be an indication of how smart a person is. The folding allows more grey matter to fit into a smaller volume, similar to a really long slinky being able to fit into a tiny box when completely pushed together. The folds are called gyri, while the spaces between the folds are called sulci. Cortical folding seems to be the consequence of maintaining or increasing the ratio of neocortex volume to brain volume with increasing brain size (Macphail, 247). The brains of elephant, dolphin, and the human being are all highly convoluted, which increases the surface area of the brain. These brains exemplify the well-known correlation between the degree of brain folding and the degree of intelligent, flexible behavior found in mammals. This site has a short list of surface areas of mammalian brains (lesser shrew 0.8cm2, cat 83cm2, human 2500cm2, pilot whale 5800cm2 etc) but not an accompanying comparison of size or weight. At any rate the Hausdorff dimension should bear some degree of correlation to the proportion of neocortex assuming that the tickness of the neocortex is constant. ...it is generally agreed that the growth of the neocortex, both absolutely and relative to the rest of the brain, during human evolution, has been responsible for the evolution of intelligence, however defined. In most mammals the neocortex has six layers, and its different functional areas (vision, hearing, etc) are sharply differentiated. The cetacean neocortex, on the other hand, has only five layers, and there is little differentiation of outer layers according to function. The neocortex of the cetacean brain has a highly developed layer I and VI, which is a pattern that has been labelled "archaic" or phylogenetically primitive and superficially similar to that of hedgehogs. Bemason introduced me to rather a nice Fractal zoomer app this morning. I had heard of fractals but hadn't really known what they were, not being a mathsy person.